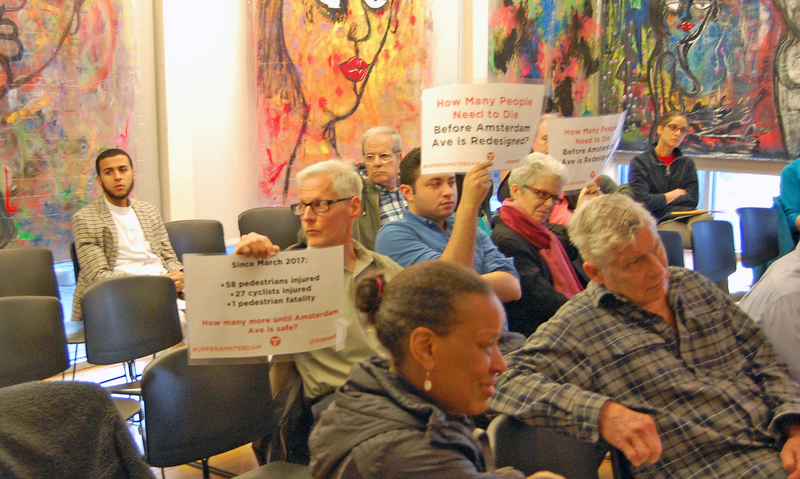 “How many more people need to die before Amsterdam Avenue is redesigned?” read signs held by protesters at a meeting of an anti-safety West Harlem community board earlier this month. But the same question can be asked of Mayor de Blasio, whose Department of Transportation has refused to move forward with its own life-saving road diet for the dangerous stretch between 110th and 155th streets, where 58 pedestrians, 27 cyclists, and 116 motorists have been injured — and one pedestrian has been killed — since the city unveiled its plan in March, 2017. Community Board 9 opposes the redesign [PDF], which would convert the avenue from four to three lanes, with a center bay for left-turning vehicles and painted bike lanes. Such redesigns have been shown to reduce speeding and crashes, but on Monday, de Blasio wouldn’t commit to overruling the board when Streetsblog asked about it. “We listen to community boards, but ultimately have to make decisions as the stewards of this city,” he said, stopping short of actually announcing said decision. “We will come back to you on that,” he added before moving on to other topics. CB9 has rejected the plan repeatedly since it was introduced, and in the days since pedestrian Erica Imbasciani was killed by a drugged-up driver in March, the board has only hardened its position, again declining to approve it at its April 4 meeting and saying it would not be forced into any decision simply because of the fatality. “The board is adamant that this tragedy should not be used to force these [safety] measures on us,” CB9 Chairman Padmore John declared on March 26 and has said since. John continued to make the specious claim that the plan would increase traffic and reduce air quality from the supposedly idling vehicles stuck in congestion. He made similar arguments in an op-ed in the Amsterdam News after the meeting. The city, however, says the lane conversion maintains the same peak motor vehicle flow and will not create more idling for motor vehicles. Protesters at the April 4 meeting just want to be safe. But the board’s Transportation Committee Chairwoman Carolyn Thompson refused to budge, saying a reckless individual killed Imbasciani — and no amount of roadway redesign would have saved her. City transportation experts have long defended road re-designs because they make crashes — even ones involving impaired drivers — less likely. So-called road diets force traffic to move at the speed of the conservative drivers, not the reckless ones. The design also puts a bike lane between pedestrians stepping off the curb and vehicle traffic. 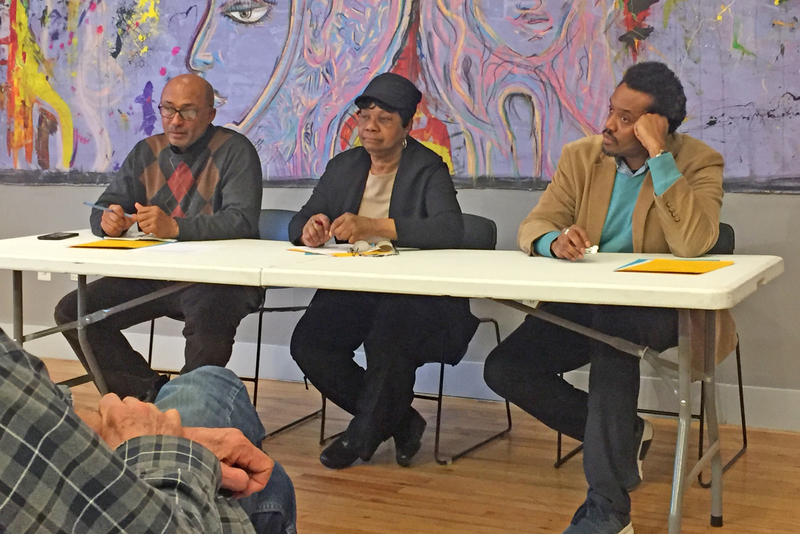 The city is not required to get community board approval before enacting safety measures, but does enable community boards to impede street safety improvements, as Streetsblog has reported. For now, the Department of Transportation is echoing the mayor’s decision to not move forward yet. “DOT is reviewing the community board’s concerns and expects to have an update soon,” agency spokeswoman Alana Morales told Streetsblog. Obviously, that didn’t satisfy activists. If you work at DOT and are sick of this bullsh*t, post in the comments. Your boss and her boss are failing this city. What the hell is going on at DOT? If you're wondering why your street doesn't have a bike lane, you might want to check with your local community board.